For Basket Weaving Tip and Techniques, see the links below and links at left. Contents are copyright V I Reed & Cane Inc. If you are reading these entries from a location other than Basketweaving.com, that means that the source has stolen our copyrighted content. 1. Do we dye our baskets before or after we weave them? If your baskets are small and you want them to be all one color, it's easiest to weave the basket first. Then mix your dye in a kitchen pail or 5 gallon USG-type bucket. Immerse the basket for the number of desired minutes. This is without a doubt the easiest way to go. If you want to combine colors, naturally you're going to dye the reed separately and weave the colors as needed. Furthermore, if you're weaving a large basket, the easiest thing to do is to pre-dye the reed. Set the dye color with a glug or two of vinegar in the final rinse. If it's a particularly rich color, as you pick up a reed weaver to weave, wipe the reed with a cloth to remove excess dye. 2. How do I make my basket pattern bigger? There ARE formulas for making a basket weaving pattern bigger. I personally don't use a formula. I use a tape measure to estimate the spoke length as it's going to run from the top, down the side, across the bottom, up the side again. Add extra length for cutting and tucking. Then you need to figure out the number of spokes. VERY IMPORTANT: you need an odd number of spokes if a centered handle or D-handle is going to be involved. Divide the desired diameter of the basket by the spoke width plus space between spokes. For example, a 12" square base. 12" divided by 1/2" spoke + 1/4" space. 12 divided by 3/4"= 16 spokes. 3. 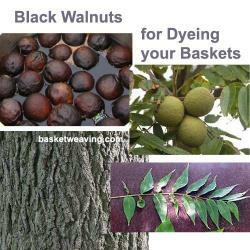 How do I dye with black walnut hulls? If you're one of the lucky ones with a black walnut tree in your yard, you need to get a small plastic trash can to keep your brew in. No need to hull the nuts. The green part is going to produce the dye. Put the nuts in a nylon stocking, mesh onion bag, burlap sack or even an old pillow case. Tie with a strong cord, and tie this cord to the handle of the trash barrel. Cover with water and let soak till you have a nice brown dye bath. Maybe a week. Maybe less. Experiment with it. The bag should keep the dye from getting too messy, but if it still gets chunks of hull, strain out the pieces. Place the basket in the dye until color is as desired. You can use it over and over again. Add more hulls as needed. Add vinegar ( OR ammonia) to keep the mold down during long-term outdoor storage. Keep the can covered so that no one gets into it. When you soak your basket (or reeds) to dye, remember that the color will be much lighter when they dry. NOTE: Some people report success with spraying the dye onto the basket using a spray bottle that can be easily obtained at grocery or hardware stores. 4. Can we use wood stains for baskets? There are so many "real" basket dyes and stains out there now, that you don't have to. Wood dyes will be much drier. But if you just can't resist that thrifty streak, mix your old wood dye with boiled linseed oil (No, don't boil the linseed oil.) and you'll have a very decent stain that you can paint on, or pour over, or even spray on. Ratio is up to the individual, but start with 2:1. Stain to Boiled Linseed Oil. For an excellent and easy stained finish, we recommend Weaver's Stain- a spray that comes in a can but does not go on like spray paint. If the mildew is extensive, soak the reed or basket in a bleach solution of approximately 1 cup of bleach to a couple gallons of water until the reed is clean. Be sure to keep this bleach bath out of the reach of children and pets. If there's not a lot, you can dab the bleach on with a cotton swap. Rinse cleaned reed and then dry thoroughly before storing.The best preventive measure is to never put away reed until it's bone dry, and never store in plastics.